...so that you can do what you really love? Abstract: I examine inflation-adjusted historical returns of the S&P 500 since the 1870s with and without dividends and backtest a couple of famous investment strategies for retirement. I also deploy some personal/philosophical arguments against the whole live-frugally-and-then-live-frugally-off-of-investments idea. Disclaimer: I'm not (any more) a finance industry professional and I'm not trying to sell you investment advice. Please consult with somebody qualified or somebody who has your best interests at heart before taking any action based on what some guy said on the Internet. The code I used to produce most of the following plots and process data is in an IPython notebook on my GitHub. Early retirement is simple, right? Just live frugally, stop drinking Starbucks lattes, save a large fraction of your paycheck, invest it into a mixture of stocks and bonds and you, too, will be on the road towards a life of work-free luxury and idleness driven by compound interest! What if there's a stock market crash just before I retire, you ask? The personal finance gurus will calm you down by saying that it's fine and the magic of altering your bond position based on your age as well as dollar cost averaging, together with the fact that the stock market returns 7% on average, will save you. As sweet as that would be, there is something off about this sort of advice. Are you saying that I really can consistently make life-changing amounts of money without doing any work? This advice also handwaves around the downside risks of investing into the stock market, including the volatility of returns. I wanted to simulate the investment strategies proposed by personal finance and early retirement folks and actually quantify whether putting my "nest egg" into the stock market is worth it. This piece of writing was mostly inspired by NY Times' "In Investing, It's When You Start And When You Finish" that shows a harrowing heatmap of inflation-adjusted returns based on the time an investment was made and withdrawn, originally created by Crestmont Research. They maintain this heatmap for every year here. This post is in two parts: in the first one, I will backtest a few strategies in order to determine what sort of returns and risks at what timescales one should expect. In the second one, I will try to explain why I personally don't feel like investing my money into the public stock market is a good idea. The data I used here is the S&P 500 index. and I'm assuming one can invest into the index directly. This is not strictly true, but index tracker funds (like Vanguard's VOO ETF) nowadays are pretty good and pretty cheap. A friend pointed me to a paper that has an interesting argument: using the US equity markets for financial research has an implicit survivorship bias in it. Someone in the 1870s had multiple countries' markets to choose from and had no way of knowing that it was the US the would later become a global superpower, large amounts of equity gains owing to that. 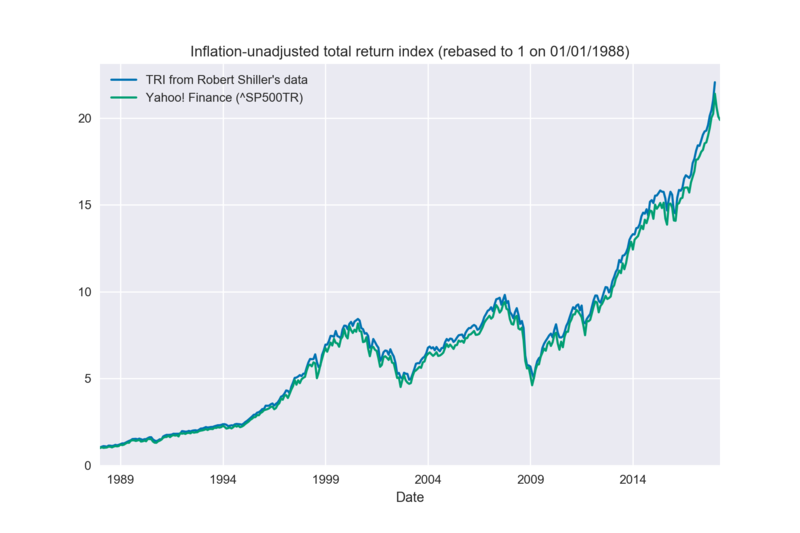 As a first step, I downloaded Robert Shiller's data that he used in his book, "Irrational Exuberance", and then used it to create an inflation-adjusted total return index: essentially, the evolution of the purchasing power of our portfolio that also assumes we reinvest dividends we receive from the companies in the index. Since the companies in the index are large-cap "blue chip" stocks, dividends form a large part of the return. I compared the series I got, before adjusting for inflation, with the total return index from Yahoo! Finance and they seem to closely match the Yahoo! data from the 1990s onwards. The average annual return, after inflation, and assuming dividends are reinvested, is about 7.5%. Interestingly, this seems to contradict Crestmont Research's charts where the average annual pre-tax (my charts assume there are no taxes on capital gains or dividends) return starting from 1900 is about 5%. 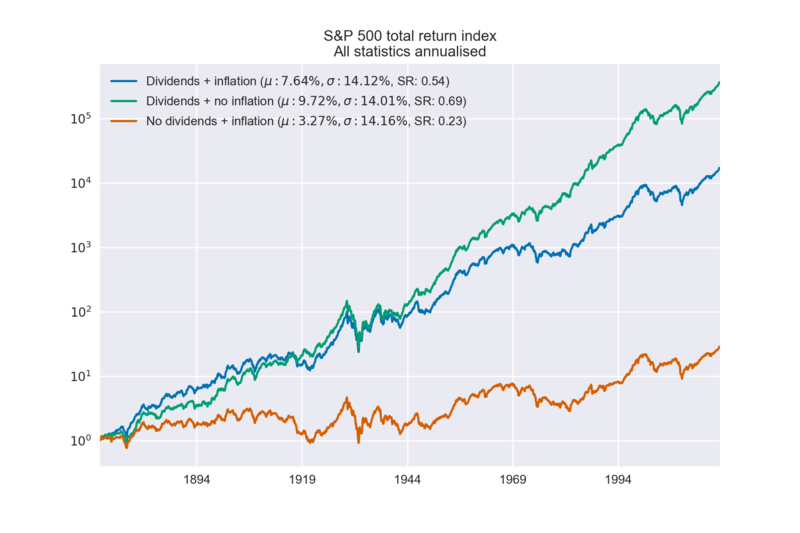 On the other hand, the return with dividends reinvested does seem to make sense: without dividends, the annualized return is about 4.25%, which implies a dividend yield close to the actual observed values of about 4.4%. 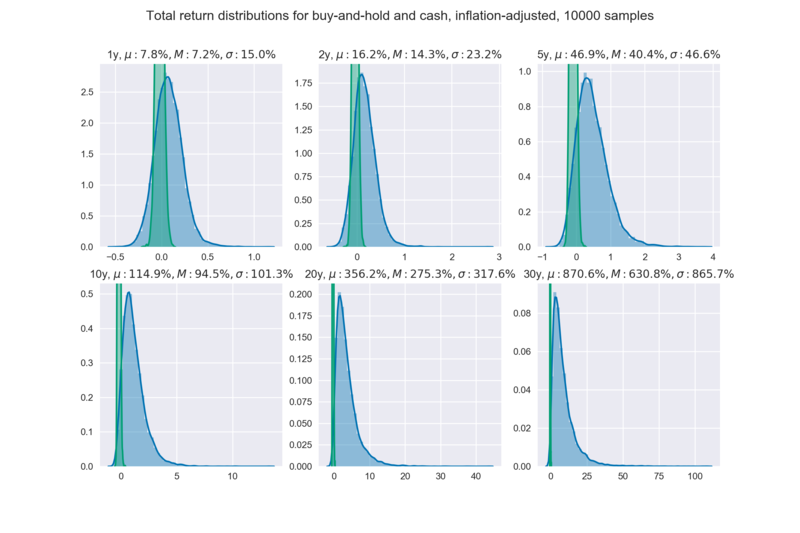 Another observation is that the returns are not normal (their distribution has statistically significant differences in kurtosis and skewness). 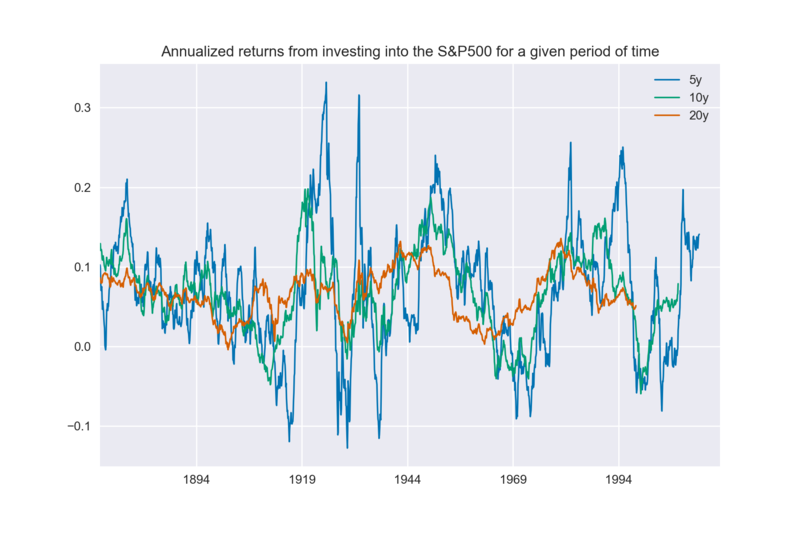 First, I wanted to plot the annualized returns from investing in the S&P 500 at a given date and holding the investment for a certain number of years. The result kind of confirms the common wisdom that the stock market is a long term investment and is fairly volatile in the short term. If one invested in the late 1990's, say, and withdrew their investment in 5 or even 10 years, they would have lost about 4% every year after inflation. Only with investment horizons of 20 years do the returns finally stabilise. 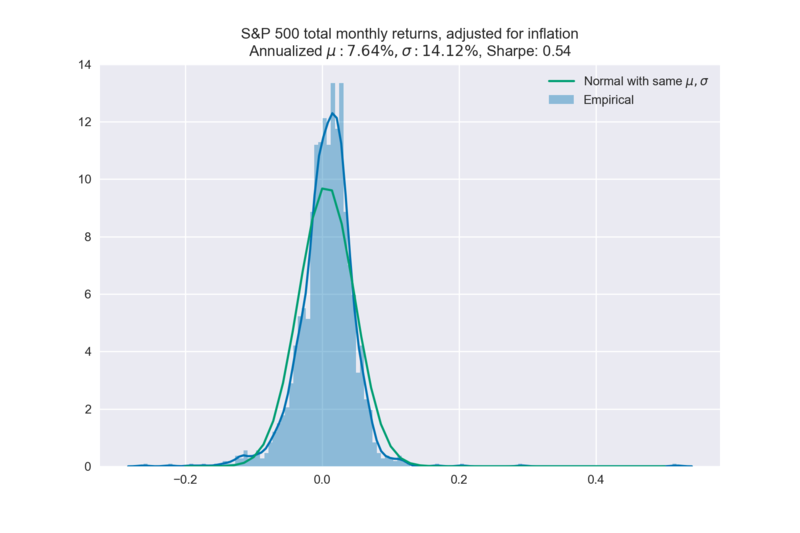 Here are the distributions of returns from investing a lump sum into the S&P 500. This time they were taken from 10000 simulations of paths a given portfolio would follow (by randomly sampling monthly returns from the empirical returns' distribution). I also plotted the inflation-adjusted returns from holding cash (since it depreciates with inflation) for comparison. What can be seen from this is that in 20 or 30 years, it seems possible to double or quadruple one's purchasing power. I also plotted a set of "hazard curves" from those sampled distributions. 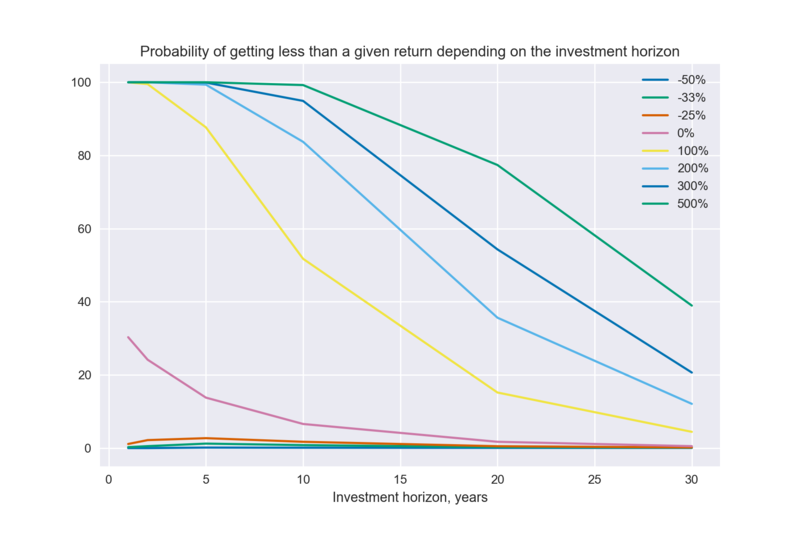 Those are the simulated probabilities of getting less than a given return depending on the investment horizon. For example, there's a 30% chance of getting a return of less than 0% after inflation (losing money) for a 1 year investment and this chance drops down to about 5% for a 20 year investment. Conversely, there's a 100% chance of getting a return of less than 300% (quadrupling the investment), but after 20 years there's a 50% chance of doing so. DCA is basically investing the same amount of money at given intervals of time. Naturally, such an investment technique results in one purchasing more of a stock when it's "cheap" and less when it's "expensive", but "cheap" and "expensive" are relative and kind of meaningless in this case. DCA is usually considered an alternative to lump sum investing, but for a person who is investing, say, a fraction of their paycheck every month it's basically the default option. 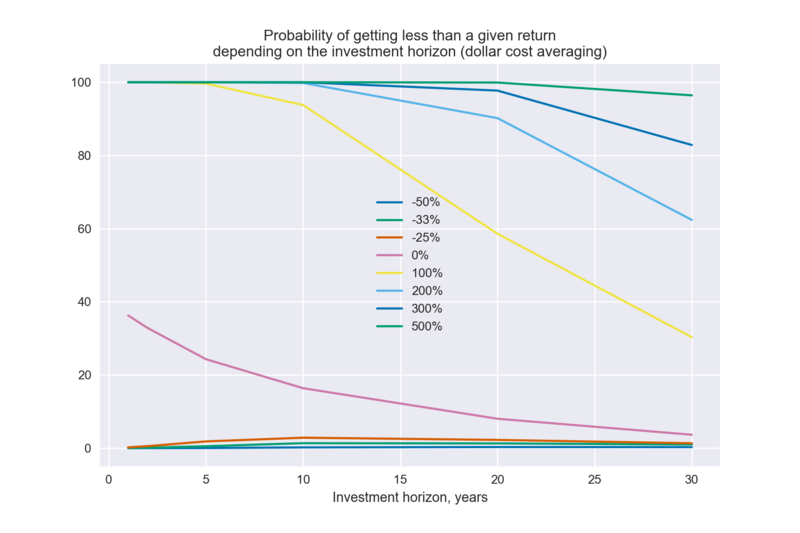 I did some similar simulations of dollar cost averaging over a given horizon against investing the same sum instantly. Unsurprisingly, DCA returns less than lump sum investment in this case. This is because the uninvested cash depreciates with inflation, as well as because the average return of the stock market is positive and hence most of the cash that's invested later misses out on those gains. DCA would do better in a declining market (since, conversely, most cash would miss out on stock market losses), but if one can consistently predict whether the market is going to rise or decline, they can probably use that skill for more than just dollar cost averaging. 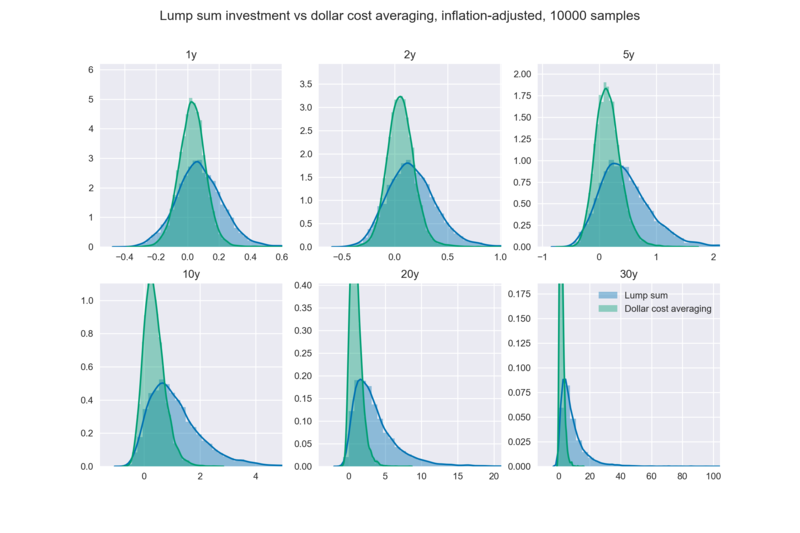 In my tests, dollar cost averaging over 20 years gave a very similar distribution to investing a lump sum for 9 years. Essentially, returns of DCA follow those of investing a lump sum for a shorter period of time. Finally, here are the "hazard curves" for dollar cost averaging. After a year of monthly investing we'd have an almost 40% chance of losing money after inflation and even after 20 years we still have a 10% chance. After 20 years, doubling our purchasing power is still a coin toss. What we have gleaned from this is that the long-term yearly return from the stock market is about 7% after inflation (but before taxes), assuming one invests over 20-30 years. Compounded, that maybe results in quadrupling of one's purchasing power (less if one invests a fraction monthly, and even less with dividend and capital gains taxes). While doubling or trebling one's purchasing power definitely sounds impressive (especially whilst doing only a few hours of work a year! ), it doesn't really feel big if you look into it. Let's say you're about to retire and have saved up $1 million (adjusted for inflation) that you weren't investing. If you were putting a fraction of that money monthly into the stock market instead you would have had $2-3 million, say. But you can live as comfortably off of the interest on $1 million as you would on $2-3 million. And on the contrary, if you have only saved $100k, dollar-cost averaging would have yielded you $300k instead, the interest on both amounts (and in retirement it has to be risk-free or almost-risk free) being fairly small. As long as one has enough money to get up that "utility cliff" beyond which they can live off of their investments in retirement, it doesn't matter how much is it. Conversely, saving by investing into the stock market is worth it only if one is very sure that that's the thing that will get them over the line. This possible climb up the cliff comes at a cost of locking in one's capital for a large amount of time (as short-term volatility in the stock market makes it infeasible to invest only for a few years). This lock-in leaves one completely inflexible in terms of pursuing other opportunities. One's basically treating the stock market as some sort of a very long-term bond where they put the money in at one end and it comes out on the other side, slightly inflated. There was also an implicit assumption in all these simulations that the future follows the same pattern as the past. Returns only become consistent after 30 years with dollar cost averaging. Someone who started investing a fraction of their savings into the general stock market 30 years ago would have gotten a 5-7% annualized return. Could they have predicted this? Probably. But could they have predicted the rise of the Web, the smartphones, the dotcom boom and crash? Probably not. I'm not saying that whatever extra money one has should be invested into Bitcoin, a friend's startup or something else. Money can also be used to buy time off (to get better acquainted with some new development or technology) or education. Is using it to buy chunks of large corporations really the best we can do? I also like the idea of "barbell investing", coined by Nassim Nicholas Taleb: someone should have two classes of investments. The first one is low-risk and low-return, like bonds or even cash. The second one is "moonshots", aggressive high-risk, low-downside, high-upside investments. Things like the stock market are considered to be neither here nor there, mediocre-return investments that might bear some large hidden downside risks. There's an argument that one should still save up excessive amounts of money (as investments or just cash) whilst living extremely frugally so that after several years of hard work they "never have to work again" and can retire, doing what they really would have loved to do this whole time. Conversely, the extreme version of the two-job route is dangerous because it teaches you so little about what you like. If you work hard at being a bond trader for ten years, thinking that you'll quit and write novels when you have enough money, what happens when you quit and then discover that you don't actually like writing novels? Paul Graham, "How To Do What You Love"
Here I am, young and retired. What do I do next? Anything? How do I know what I like? Do I have any contacts that I can rely upon to help me do that "anything"? I don't feel that toiling away somewhere, being bored for a couple of decades, so that I can then quit and be bored anyway (since I hadn't learned what makes me tick), is a useful life strategy. What about all those people who did become rich investing into the stock market? Warren Buffett is one of them, probably one of the most famous investors in the world. But he made his first couple of million (in 2018 dollars) working for Benjamin Graham, in salary and bonuses. In essence, if he wanted to, he could have retired right there and then. Only then did he proceed to increase his wealth by investing (first running an investment partnership and so working with the partnership's money and presumably charging a performance fee, then through Berkshire Hathaway). None of these methods are available to someone with a personal investment account. Essentially, I think that the stock market is a wealth preservation, not a wealth generation engine. Publicly-listed companies are large and stable, paying consistent and healthy dividends with the whole investment yielding a solid, inflation-beating return. But for me? I think it's important to stay flexible and keep my options open. If someone offers me an opportunity somewhere, I don't want to say "Sorry, I have a mortgage and the rest of my money is invested in healthy companies with solid, inflation-beating returns that I can't currently sell because it's in drawdown and would you look at the tax advantages". I want to be able to say "Sure, let me give a month's notice to my landlord. Where are we going?"